What Does Negative Slope Mean? 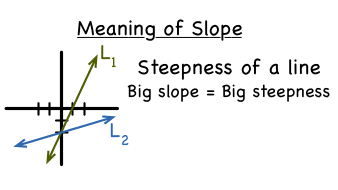 What does a negative slope mean? What does the graph of a negative slope look like? Find the answers to these questions by watching this tutorial! What Does Positive Slope Mean? What does a positive slope mean? What does the graph of a positive slope look like? Find the answers to these questions by watching this tutorial! You may be able to guess that vertical lines are lines that go straight up and down, but did you know that all vertical lines have the same slope? In this tutorial, learn all about vertical lines including their slope and what the equation of a vertical line looks like! Ever look at the horizon when the sun is rising or setting? Know why it's called the horizon? It's a horizontal line! And just like the horizon, horizontal lines go straight left and right. In this tutorial, you'll learn all about horizontal lines including their slope and what the equation of a horizontal line looks like. What is Rate of Change? Trying to describe the how something changes in relation to something else? Use rate of change! In this tutorial, learn about rate of change and see the difference between positive and negative rates of change! How Do You Find the Slope of a Line from a Graph? Trying to find the slope of a graphed line? First, identify two points on the line. Then, you could use these points to figure out the slope. In this tutorial, you'll see how to use two points on the line to find the change in 'y' and the change in 'x'. Then, you'll see how to take these values and calculate the slope. Check it out!